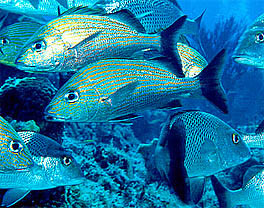 Grunts may be the most common large reef fish in the Caribbean. Click here to learn about Grunts and see more of this school. What's in a name? Should we call this coral Elkhorn Coral or Acropora Palmata? 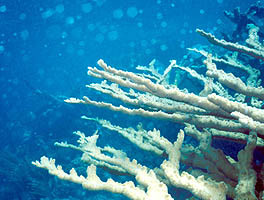 Click here to see this great coral up close. Zoanthids are interesting little animals. To me, they look like mushrooms. 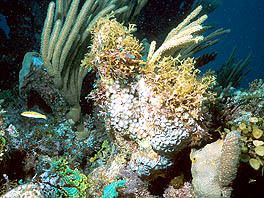 Click here to learn about these critters and see their neighbors on this great reef near San Salvador.